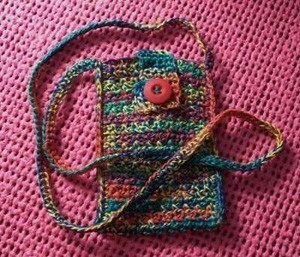 With your choice of double crochet thread and 3 hours or so, you can have a nice little purse for ID, Ipod, or cellphone! With your crochet thread doubled, chain 20 on your hook. Turn, making a single crochet in the next chain. Chain one, skip one of the chain, and make a single crochet in that next chain, and continue to the end. If you have a chain at the end, go back and make sure you counted the original chain at 20, or that you didn't skip the first chain from hook. You should always have an even 20 across. Chain 1, turn and make a single crochet in that first stitch, chain one and keep going. You will continue this pattern until you have completed 54 rows, or longer if you want it for a custom sized phone. Bind off the last row by making a slip stitch in each (don't skip any) stitch of the last row. For the clasp, join the hook on the 7th stitch across the original row, and make 6 single crochets in the 6 stitches, chain one and turn, and repeat this till you have made 8 rows. Here comes the tricky part. On the 9th row, you will only make 3 single crochets, making 4 rows and binding off. This is 1/2 of the button hole. For the other half, join back at the base of the split, and make 3 single crochets for 4 rows, then on the last row, join with a slip stitch to the other half of the split. Bind off and work in all of your tails. Note: With regular thread and needle, you may want to bind all the tails on the inside. This prevents anything from ever slipping out. With your choice of button, sew it onto the purse, using the clasp to measure where the button is to go. Once the button is in place, tie the ends several times in the back, and I put a small circle of felt over the ties and hot glued them down. Fold your work in half, and join with the hook on the right side and bottom fold, making sure you catch all the stitch on the back half. Make single crochets to bind the front to the back all the way up. Keep making a chain to the desired length of the shoulder strap you want, long for over your shoulder, or short for a clip on to a belt loop or key ring. Keeping it straight, join with the chain to the second half of the purse and crochet down to the bottom just like you did on the first half. Chain 1 and turn, going back up the side of the purse with a slip stitch, then a single crochet for the shoulder loop, then slip stitch back down to the end of the purse. Bind off and work in any tails. First off, I apologize for my late response. I have been in the moving mode for about 8 weeks, and just now got dial up internet. Yeah, dial up! Ok, according to Lion Brand and Google, it's the same as a size 4. I only have that one, so I can't compare it. I used a larger size because I almost always crochet with two strands. It's not only stronger but faster. What a great project. I will be making some of these for our next charity fundraiser! One question, do you know what size 'e' is in european sizes? Or at least can you tell me if the hook is afine or thick one. This mini purse is very cute, and so pretty...can you tell me what thread you used, because the colors are beautiful. Thanks for the time you put into those directions, it's a lot of work to write that all down. You used "double thread", what size thread? Is it the finer yarn or just regular yarn. Thanks.